Squiggy Piggy is a multiplayer game created by Jenny Q. Ta, founder and CEO of Sqeeqee.com. 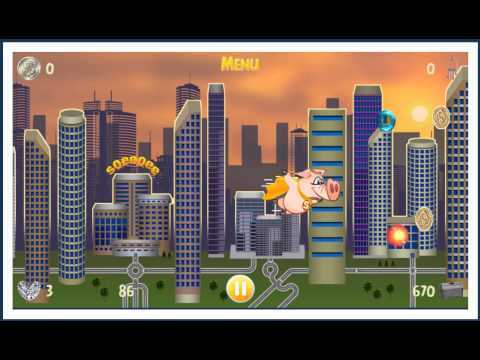 The game is a side-scroller where the player controls a flying pig, flying through the City of New York building wealth by capturing gold coins, gold and silver bullion bars and saving them in a treasure chest. Squiggy Piggy has an impossible mission where players can take on the journey alone or compete with friends, up to four players per group, to see who can get the highest score! Squiggy Piggy is completely free to play, but some in-game items, such as extra moves or lives, will require payment. · Complete up to three levels and unlock wealth. · Easily sync the game between devices – from your Mac or Windows desktop to your iPad, iPhone, or Android device – and play no matter where you are. The game also contains third-party advertisements and includes the option to make in-app purchases. The bill-payer should always be consulted before any purchase is made.